I hate bugs. Most right-minded adults do. They’re icky, yucky and creepy - and that’s on a good day. When I’m at the cottage, give me a rolled-up newspaper and a fresh spray can of toxic chemicals, and I’m one happy - if grim - camper. Mosquitoes, house flies, centipedes, beetles and roaches may someday inherit the world - but not on my watch. and monarchs can’t resist them. However, like most rules, there are exceptions. Take, for instance, the butterfly. It’s hard to find someone who dislikes this flittering and fluttering species and while scientific information on this isn’t readily available, it’s a fair bet to be the only insect most Canadians wouldn’t mind alighting on their hand or other extremity. And if you’re careful not to look at them with a magnifying glass, it’s easy to forget they’re related to the creatures you dispatch to bug heaven every chance you get. According to Dr. Lincoln Brower, quoted on the www.asterisk.bc.ca website, the monarch is probably the most common butterfly in the world. “It evolved in South America, we believe, and from Central America and Mexico invaded the United States and Canada,” he says. It’s also “one of the few butterflies in the world that is able to explode out of the tropics into the temperate zone which is the most complex migration of any insect, of any invertebrate in the whole world. It's so birdlike." It’s also the only insect species people love to see in swarms. This spectacle can be seen every fall when up to 100 million of these colourful monarch butterflies across the northern climes of the continent begin their 3-4,000 mile journey south of the Rio Grande. A great place to see part of this amazing migration every year is at Point Pelee in southwestern Ontario. In addition to being the southernmost point in Canada, the peninsula which juts well into Lake Erie improves the monarch’s odds of clearing the Great Lake barrier. As people who live along the shores of Lake Ontario can tell you, often seeing the critters wash up on shore after an ill-fated attempt to cross the wide water, they need all the help they can get. At Point Pelee, they gather by the thousands and wait patiently for the right breeze and split before the frost. Monarchs can’t take to the skies in cold weather. There’s a lot scientists don’t know about the monarch, such as how a bug with a brain the size of a pinhead finds its way to the Transvolacanic mountains of Mexico, returning to the same dozen or so wintering areas. Scientists speculate that monarchs conserve their strength for the big trip by relying on wind currents, pausing to take nectar along the way and actually gaining weight along their journey. They’re the only butterflies in the world that brave such a return trip every year, but unlike birds, they make just the one circuit. Not all monarchs make the big journey - it’s the great-great-great grandchildren of the returning butterflies that continue the family tradition. Monarchs head south in their continuing quest for milkweed, which monarch caterpillars feed on during their larval stage. On its way to becoming the gorgeous, bright-winged creature we love, a caterpillar chows down on milkweed big time, growing to five cm. long and up to 3,000 times its birth week in under two weeks. Straight milkweed may seem like a bland diet to you, but it works well for the monarch. Seems it contains a nasty poison called cardiac glycoside. Doesn’t bother the butterfly but over time birds have learned that it makes them very unpalatable. Birds see the brightly coloured monarch larvae or butterfly and give them a free pass. After pigging out, the caterpillar moves into the chrysalis stage, attaching itself to a sheltered spot like the underside of a leaf and begins transforming into a pupa. In just five days the amazing metamorphosis from being just another icky bug into butterfly takes place. According to the World Wildlife Fund website, males are distinguishable from females by the presence of black coloured scent glands on each of their hind wings - but I can’t imagine getting close enough to check that out. Males use those scent glands to fulfill the mission of males everywhere - attracting females. But unlike that bottled musk you used in college, butterfly pheromones really work - billions of butterflies can’t be wrong! The monarch is also well occupied fattening up for the migration to come. Its adult diet gets a little more interesting - plant nectar, sap and dew. And there’s a great place that offers all this stuff: your cottage! If you like butterflies, you’ll be thrilled to discover a plant you can add to your garden they find irresistible. My parents have one of those so-called “butterfly bushes” beside their deck and they’ve found it to be a popular hangout with monarch butterflies as well as hummingbirds seeking the same sweet nectar. 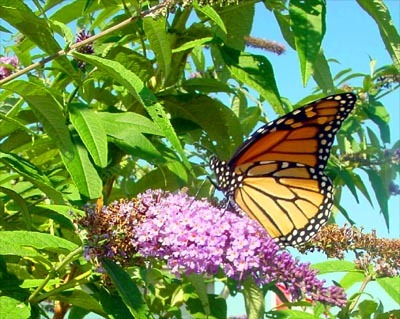 There over 100 types of buddleia, which is the official name for the butterfly bush. It’s not for the finicky gardener as it can be a little difficult to keep under control - the pros say you’re better off letting the plant do its own thing, so put the trimmer away. Best of all for those of us with brown thumbs, it’s very easy to grow and real hard to get rid of. It laughs at most bug infestations, doesn’t care much what kind of soil you put it in and puts up with just about any pollution you can throw at it. Butterflies are fun to watch and after awhile, you come to appreciate their peculiar rituals. Like a lot of other species, the males are territorial and chase each other off to get a better shot at the ladies in the vicinity. For their part, female monarchs like to keep you guessing where they’re going to lay their eggs. You might notice them taking a drink in puddles after a cloudburst or taking in some sun on a rock to rev up for flight first thing in the morning. Like a lot of other species trying to co-exist with man, monarch butterflies are up against it. Milkweed isn’t likely to wind up as plant of the month in Home & Garden and many gardeners rip it out as a noxious weed. 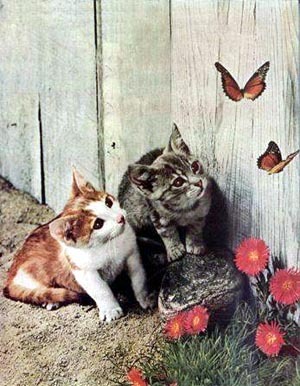 Other hassles butterflies face include human development encroaching on their environment, pesticides and stupid cats that didn’t get the memo about the poison. The inability to travel anywhere in a straight line has to be tough, too. On the Journey North website, Dr. Brower says he and his colleagues fear the migration of the monarch butterfly is endangered. “ I have predicted collapse of the eastern migratory population over the next two decades because of continuing deforestation in Mexico,” he says. That’s one of the reasons why the governments of Canada, the U.S. and Mexico, are working together to develop strategies to protect the monarch butterfly through various conservation schemes. What can you do? In planting a butterfly garden, you’ll be doing your part to help preserve an amazing species which will bring you hours of placid enjoyment…which is a lot more than you can say for those dang deerflies.